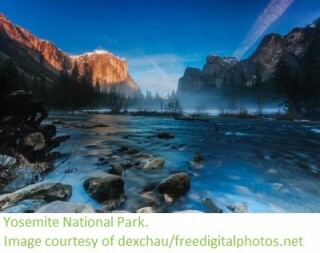 In celebration of the National Park Service’s 98th Birthday on August 25th, all National Parks in the US are free to enter for the day – so we decided to take a look at some of the opportunities offered by five of the National Parks as suggested by ViewRanger users. A trail that can be tackled in one of two directions (or both if you’re feeling really energetic! ), most people prefer to catch the scheduled bus service to Glacier Point and then hike down towards Yosemite Valley as this is easier. The Panorama Trail more than lives up to its name and affords spectacular views the whole way, while an optional detour to Panama Point gives even more astounding panoramic views across the Park. With stunning views across Yosemite Valley, this is a great hike guaranteed to make an impression, so click here to check out the route. A trail for more experienced hikers, the astonishing sights are ample reward for the challenging walking conditions. Taking in rocky canyons, a pine forest and sandstone cliffs, this hike is best enjoyed early in the morning or during spring or autumn months as the temperatures can get very high. 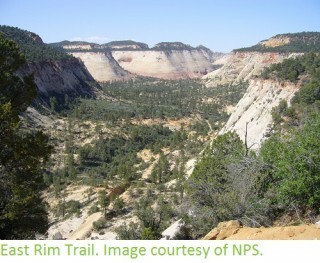 A more child-friendly alternative is to walk the first part of the trail to Jolley Gulch, which has some lovely views across the canyon, while those looking for further hiking opportunities could continue along the East Rim for an even more demanding climb. For a challenging yet rewarding climb through some beautiful settings, click here to see the ViewRanger user-recommended route. A nice short walk for the whole family, this highly popular trail starts at Bear Lake trailhead, where hikes around Bear Like and lakeside views can be enjoyed. 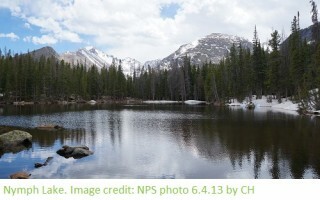 From there, the mainly paved trail ascends to Nymph Lake, and hikers can catch glimpses of Longs Peak through the trees from the trail. Nymph Lake itself is pleasantly ringed by lilies and affords some stunning views of Hallet Peak. For those wishing for even better views, the trail continues on a little while to a break in the trees, which provides a wonderful outlook across to Longs Peak. While this trail is brief, it is extremely popular, and can be extended further with walks to Dream Lake and then either Emerald Lake or Lake Haiyaha, so it is well worth a look. See the route by clicking here. A challenging hike with some great scenery, this route is notable for including a fairly difficult rock scramble across steep slopes and narrow passages, so inexperienced hikers may need to take particular care. 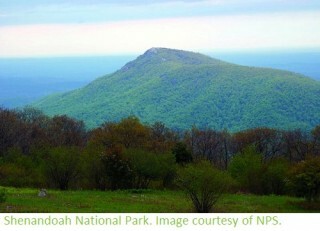 Hugely popular for its amazing outlooks, the summit of the trail enjoys 360 degree views across Shenandoah National Park. The varied terrain – including the strenuous rock scramble – and the fabulous views make this a particularly rewarding hike for those who complete it. One of the most popular hikes in the Park, be prepared to use your arms as well as your legs for this trek, and while there may be queues in busy periods they are a testament to the rewarding views once at the top, so find out the route here. 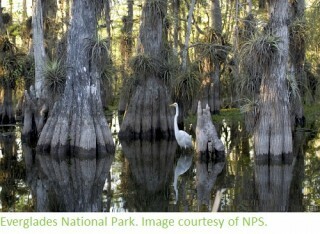 A kayak or canoe is required for our users’ final recommended trip through the National Parks, as the Everglades is famous for its myriad waterways and mangrove forests, but there’s a whole lot more to be found here as well. This route takes you on a pleasant journey from Everglades City past Chokoloskee island, and then into the mouth of the Lopez River. A campsite halfway down the River is the ending point for this route, and also allows visitors to investigate the remains of the dwelling of one of the area’s first settlers. For those who want to try something a bit different, this is a great way to explore one of the most unique areas in the world, so have a look at the route here. These five trails are just a small taste of the amazing variety that the United States National Parks hold, so if you decide to visit any of these stunning national treasures don’t forget to take a look at the many routes ViewRanger users have uploaded. Then upload your own trips and photos to give others the same great experience that you had!